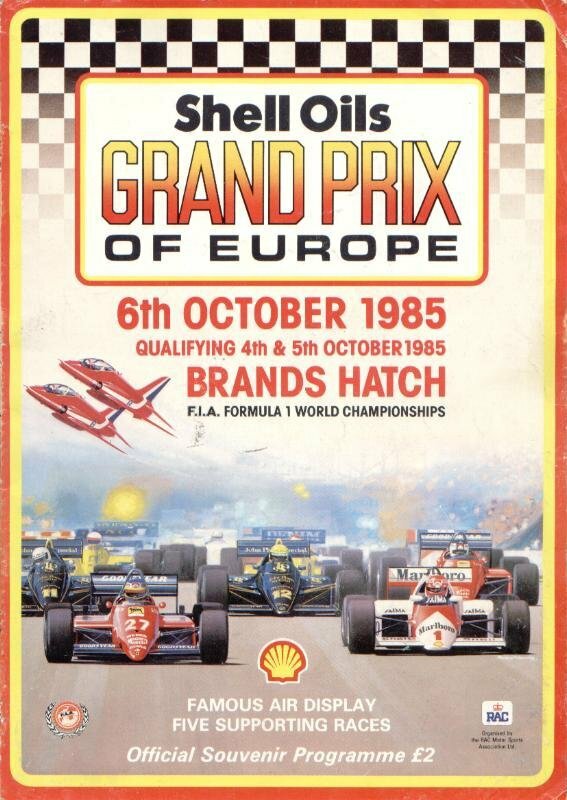 The 1985 European Grand Prix (formally the Shell Oils Grand Prix of Europe) was a Formula One motor race held at Brands Hatch on 6 October 1985. It was the fourteenth race of the 1985 Formula One World Championship. The 75-lap race was won by Nigel Mansell, driving a Williams-Honda. It was Mansell's first Formula One victory in his 72nd race start. Ayrton Senna finished second in a Lotus-Renault, having started from pole position, while Mansell's teammate Keke Rosberg finished third. Alain Prost finished fourth in his McLaren-TAG which, combined with Michele Alboreto's retirement with a turbo failure, secured the Frenchman his first Drivers' Championship. Qualifying saw Ayrton Senna take his sixth pole position of the season in his Lotus-Renault, averaging 140.106 mph (225.479 km/h), the first time anyone had lapped the Brands Hatch circuit faster than 140 mph. Compatriot Nelson Piquet was second in his Brabham-BMW, 0.3 seconds behind, followed by the Williams-Hondas of Nigel Mansell and Keke Rosberg. Philippe Streiff was a surprise fifth in his Ligier, ahead of Alain Prost's McLaren; the top ten was completed by Marc Surer in the second Brabham, Derek Warwick in the Renault, Elio de Angelis in the second Lotus and Jacques Laffite in the second Ligier. Prost's Drivers' Championship rival, Michele Alboreto, could only manage 15th in his Ferrari. Prost's teammate Niki Lauda was unfit to race due to the wrist injury he had suffered at the previous race in Belgium. His place was taken by former McLaren stalwart John Watson, in his first F1 race since the end of 1983; the Ulsterman qualified 21st, over five seconds behind Senna. Tyrrell had re-expanded to two cars, with Martin Brundle joined by Italian newcomer Ivan Capelli, who qualified 24th. Senna led off the line from a fast-starting Mansell, while Prost slid onto the grass and fell to 14th. Mansell then ran wide at Druids, allowing Rosberg and Piquet past. On lap 7, Rosberg spun at Surtees Corner while attempting to overtake Senna, and was hit by Piquet. The Brabham was out on the spot, while Rosberg limped back to the pits for repairs, losing a full lap in the process. Mansell was now second again, followed by de Angelis, Stefan Johansson in the second Ferrari and Surer, with Prost up to seventh following a charge through the field. When Rosberg rejoined he blocked Senna, allowing teammate Mansell to catch up to the Lotus before getting past at Surtees. The Englishman then set about building a lead, while Rosberg continued to hold up Senna. On lap 14 Alboreto, who had made a good start and had run as high as sixth, suffered a fiery turbo failure, effectively ending his Championship challenge. Prost, running sixth at this point, now only needed to finish fifth to secure the title. Surer had moved ahead of Johansson by this stage and was closing on de Angelis, while Laffite was also on a charge, passing Prost and Johansson in quick succession. Surer overtook de Angelis on lap 21, followed soon after by Laffite. The two then closed up to Senna, Surer getting past on lap 35 and Laffite one lap later. At this point, Mansell's lead was 14 seconds, while Prost was still seventh. On lap 51, having just been re-passed by Senna, Laffite pitted for new tyres, dropping to eighth and promoting Johansson to fourth. Shortly afterwards, Prost passed de Angelis for fifth as the two were lapping Watson; this became fourth when Johansson started to suffer an electrical problem. Laffite retired on lap 59 with an engine failure, followed one lap later by Johansson. Surer was still running second when, on lap 63, he suffered a turbo failure similar to Alboreto's. This left Mansell around 20 seconds clear of Senna, with Prost now third, de Angelis fourth and Rosberg back up to fifth. Rosberg soon passed de Angelis before Prost, taking no chances, allowed the Finn through into the final podium position. Up front, Mansell cruised to his first Formula One victory, his final margin over Senna being 21.4 seconds. Rosberg finished 37 seconds behind Senna and eight ahead of Prost, who celebrated becoming France's first Formula One Drivers' Champion. De Angelis and the Arrows of Thierry Boutsen rounded out the top six, Boutsen holding off Watson for the final point in what would turn out to be the Ulsterman's last F1 race. Having been brought in to replace the injured Niki Lauda, John Watson raced at this event with the number 1 usually reserved for the reigning Drivers' Champion. This is the only occasion that a non-champion has used the number since Ronnie Peterson during the 1974 season. This was the first Formula One victory for an English driver since James Hunt at the 1977 Japanese Grand Prix. ^ "Motor Racing Programme Covers: 1985". The Programme Covers Project. Retrieved 29 October 2017. ^ "1985 European Grand Prix". formula1.com. Archived from the original on 23 June 2014. Retrieved 23 December 2015. ^ Williamson, Martin (November 2009). "John Watson - F1 Driver Profile". ESPN. Retrieved 27 June 2014. ^ a b "Europe 1985 - Championship • STATS F1". www.statsf1.com. Retrieved 15 March 2019. Wikimedia Commons has media related to 1985 European Grand Prix.